I am reviewing A Long Way From Chicago, by Richard Peck. I consider it a historical fiction or humorous book with several themes. This book is a compilation of several stories about two kids, Joey and Mary Alice Dowdel, going to see their grandma for a week during every summer for seven years. Each visit is different in its own special way. Some of the stories include: the catching-in-the-act and revenge on four prankster kids; an illegal fishing trip; and, a wrestling match between two of the oldest men alive. Joey, the narrator, says Grandma Dowdel becomes a different woman every year. The book takes place in Illinois’ Piatt County. I like the writing style especially because it involves a lot of funny similes and interesting vocabulary. Although it takes place in the Midwest, it has a very Southern feel to it. 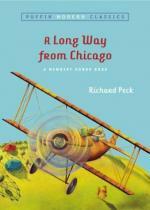 I’d recommend A Long Way From Chicago, by Richard Peck, to anyone who likes humor or old-time stories from the Great Depression era.